On Nov. 13, 1985, the Nevado del Ruiz volcano in the Andes – about 80 miles west of Bogota, Colombia – erupted, sending a pyroclastic flow down its mountainside. The heat melted the snow at an elevation of more than 17,000 feet, and volcanic ash muddied the resulting water – called lahar – that rushed into the nearby town of Amero. More than 23,000 people died. “This volcano killed over 70 percent of the town’s population. They were unprepared for the eruption,” said Kevin Reath, a Cornell postdoctoral researcher. Reath’s work aims to prevent that from happening again. He has merged 17 years of satellite data on volcanoes with ground-based detail to form a model for state-of-the-art volcanic eruption prediction. Reath’s paper, “Thermal, Deformation, and Degassing Remote Sensing Time Series (CE 2000–2017) at the 47 Most-Active Volcanoes in Latin America: Implications for Volcanic Systems,” was published in the Journal of Geophysical Research: Solid Earth (American Geophysical Union) in February. “Volcanoes are hazardous to local and global populations, but only a fraction of volcanoes are continuously monitored by ground‐based sensors,” Reath said. In South America, volcanoes lace the Ring of Fire around the Pacific Ocean. 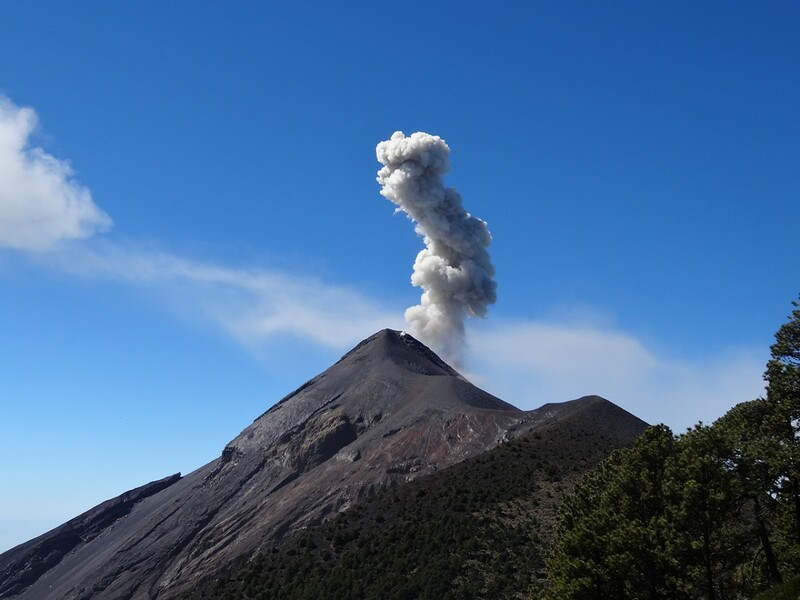 More than 60 percent of Holocene-era volcanoes in Latin America are unmonitored by ground-based sensors, and those with ground sensors still have gaps that satellites can fill, Reath said. “We are compiling remote sensing data that has been underutilized,” he said. The model aggregates three types of critical information: thermal data, such as volcanic hot spots and how they change over time; degassing data, which examines the presence of sulfur dioxide; and deformation data, accounting for inflation and deflation of magma reservoirs – pockets of lava inside the Earth. “These data types have never really been intercompared in such an extensive database,” said Reath, who hopes to extract a more-robust understanding of volcanic processes. But his work is not all volcanic eruptions. With over 17 years of satellite data, the scientists can find value in observing quiet among the volcanoes. “When we can see the volcano calm and then see the volcano when it is erupting, we can observe what’s happening leading to eruption. We can get a comprehensive picture of a volcanic behavior,” he said. Joining Reath on the paper are: Matthew Pritchard, Cornell professor, earth and atmospheric sciences; Francisco Delgado, Ph.D. ’18; Samantha Moruzzi ’20 and Allison Alcott ’18; and Scott Henderson, Ph.D. ’15, former Cornell postdoctoral researcher. This work was supported by NASA; the European Space Agency; and the Volcano Remote Sensing Working Group, John Wesley Powell Center for Analysis and Synthesis, U.S. Geological Survey. Cassini’s wide-angle camera captures the sunlit side of Saturn’s rings June 26, 2016, offering a good view of the B ring from about 940,000 miles away. 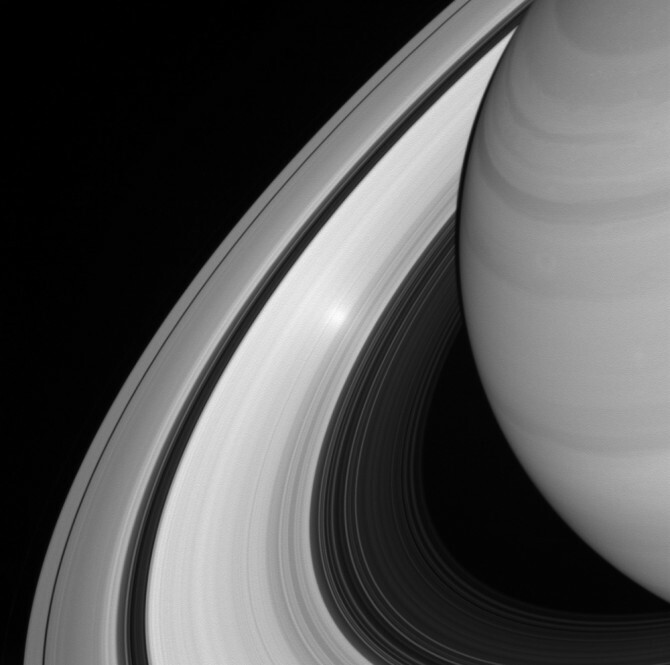 Data from the last days of the NASA spacecraft Cassini show that Saturn’s beautiful, extensive rings are relatively young – perhaps created when dinosaurs roamed the Earth – because the ring’s mass is less than previously thought and its frozen components are surprisingly bright and free from dusty cosmic impurities, according to a study published Jan. 17 in Science. “Based on previous research, we suspected the rings were young, but not everyone was convinced,” said Phil Nicholson, Cornell professor of astronomy and a co-author of “Measurement and Implications of Saturn’s Gravity Field and Ring Mass”[Science above]. Before Cassini’s demise when it crashed into Saturn in September 2017, the spacecraft passed repeatedly between the rings and the planet’s cloud tops to study Saturn’s gravity field and the rings’ mass. Cassini (and two Voyager spacecraft) had studied Saturn’s rings from afar, but no craft had yet ventured into the rings to obtain up-close data. The scientists found that the rings – particularly the dense B-ring, one of the three main rings and the brightest visible in a telescope – had lower masses than many had expected, indicating a relatively young age. While Saturn is about 4.5 billion years old, the new Cassini data indicate that the rings probably formed between 10 million and 100 million years ago, according to the lead researchers from Sapienza University in Rome. Had the rings been contaminated and darkened by interplanetary debris over a longer period, they would appear much darker, according to NASA’s Jet Propulsion Laboratory. In 2016, Zhimeng Zhang, Ph.D. ’16, led work examining the dust content of Saturn’s C ring. This research determined that the C ring, once thought to have formed in the primordial era, was less than 100 million years old. In 2017, she reported on similar measurements of the A and B rings, obtaining similarly young ages. Electron microscopes have been capable of taking snapshots of individual atoms for nearly half a century. But we’ve never seen anything quite on this scale. Electrons can have pretty small wave-like properties that depend on the energy they contain, making them perfect for seeing extra small objects. Instead of lenses, they’re focussed using electromagnetic fields. Aberrations in these fields can limit the size of objects we can see, much as deviations in lenses can blur images. Engineers usually fix these with the electron microscope equivalent of glasses, adding corrective devices to ‘fix’ the picture. This fix only goes so far, though. Multiple aberrations demand additional devices, which could theoretically pile up to the point that it’s an engineering nightmare. A device called an electron microscope pixel array detector (EMPAD) does away with the need for these ‘glasses’ by taking another approach. It’s a catcher’s mitt for electrons that bounce off the sample made up of a 128 x 128 array of electron-sensitive pixels. Rather than build an image based on the location of the electrons, it detects the angles of each electron’s reflection. Working backwards using a technique usually applied to X-ray microscopy called ptychography, it’s possible to build a four-dimensional map that tells not only where the electrons came from, but their momentum as well. “It’s essentially the world’s smallest ruler,” says physicist Sol Gruner. Since this beam was a gentle 80 keV, the electrons weren’t energetic enough to break up the structure of the molybdenum disulfide sheets, as they might in a more traditional setup. As data science becomes pervasive across many areas of society and is increasingly used to aid decision making in sensitive domains, we need to guarantee its fairness and understand its limitations. A large team of Cornell University researchers, led by Kilian Q. Weinberger, Computer Science, are establishing the Center of Data Science for Improved Decision-Making, which combines expertise from computer science, information science, mathematics, operations research, and statistics. The goal of the center is to pursue basic research that will contribute to the theoretical foundations of data science, with topics of broad applications that impact and benefit society. Five concrete research directions include privacy and fairness, learning on social graphs, learning to intervene, uncertainty quantification, and deep learning. The center will advance knowledge in these areas and broaden the range of disciplines and perspectives that can contribute to these challenging issues. Key inquiries include how to protect the privacy of individuals and their data, how to preserve fairness in decision making, how the structure of processes within social networks impacts the application of data science, and how to determine and quantify the uncertainty of machine learning’s predictions. Researchers will also probe deep learning algorithms—what they learn and why they generalize so well—and the foundation of experimental design and reasoning, underpinning algorithms that propose interventions, from policy to treatment recommendations. The deep integration of knowledge, techniques, and expertise from multiple fields will form new and expanded frameworks for addressing scientific and societal challenges and for finding new opportunities. Their research is exploring new physical phenomena in atomically thin materials. Under construction in the US, the CBETA multi-turn energy-recovery linac will pave the way for accelerators that combine the best of linear and circular machines. The main linac cryomodule. No image credit. When deciding on the shape of a particle accelerator, physicists face a simple choice: a ring of some sort, or a straight line? This is about more than aesthetics, of course. It depends on which application the accelerator is to be used for: high-energy physics, advanced light sources, medical or numerous others. Linear accelerators (linacs) can have denser bunches than their circular counterparts, and are widely used for research. However, for both high-energy physics collider experiments and light sources, linacs can be exceedingly power-hungry because the beam is essentially discarded after each use. This forces linacs to operate at an extremely low current compared to ring accelerators, which in turn limits the data rate (or luminosity) delivered to an experiment. On the other hand, in a collider ring there is a limit to the focusing of the bunches at an interaction point as each bunch has to survive the potentially disruptive collision process on each of millions of turns. Bunches from a linac have to collide only once and can, therefore, be focused to aggressively collide at a higher luminosity. Linacs could outperform circular machines for light-source and collider applications, but only if they can be operated with higher currents by not discarding the energy of the spent beam. Energy-recovery linacs (ERLs) fill this need for a new accelerator type with both linac-quality bunches and the large currents more typical of circular accelerators. By recovering the energy of the spent beam through deceleration in superconducting radio-frequency (SRF) cavities, ERLs can recycle that energy to accelerate new bunches, combining the dense beam of a linear accelerator with the high current of a storage ring to achieve significant RF power savings. 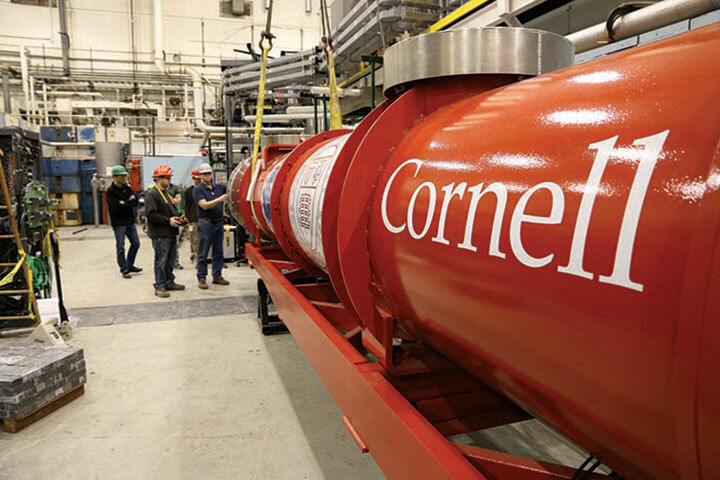 A new facility called CBETA (Cornell-Brookhaven ERL Test Accelerator) that combines some of the best traits of linear and circular accelerators has recently entered construction at Cornell University in the US. Set to become the world’s first multi-turn SRF ERL, with a footprint of about 25 × 15 m, CBETA is designed to accelerate an electron beam to an energy of 150 MeV. As an additional innovation, this four-turn ERL relies on only one return loop for its four beam energies, using a single so-called fixed-field alternating-gradient return loop that can accommodate a large range of different electron energies. To further save energy, this single return loop is constructed from permanent Halbach magnets (an arrangement of permanent magnets that augments the magnetic field on the beam side while cancelling the field on the outside). CBETA floor plan. No image credit. 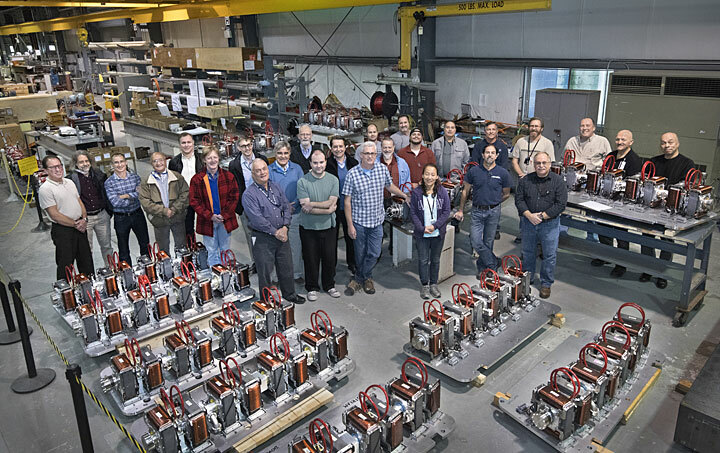 Initially, CBETA is being built to test the SRF ERL and the single-return-loop concept of permanent magnets for a proposed future electron-ion collider (EIC). Thereafter, CBETA will provide beam for applications such as Compton-backscattered hard X-rays and dark-photon searches. This future ERL technology could be an immensely important tool for researchers who rely on the luminosity of colliders as well as for those that use synchrotron radiation at light sources. ERLs are envisioned for nuclear and elementary particle-physics colliders, as in the proposed eRHIC and LHeC projects, but are also proposed for basic-research coherent X-ray sources, medical applications and industry, for example in lithography sources for the production of yet-smaller computer chips. The theoretical concept of ERLs was introduced long before a functional device could be realized. With the introduction of the CBETA accelerator, scientists are following up on a concept first introduced by physicist Maury Tigner at Cornell in 1965. Similarly, non-scaling fixed-field alternating-gradient optics for beams of largely varying energies were introduced decades ago and will be implemented in an operational accelerator for only the second time with CBETA, after a proof-of-principle test at the EMMA facility at Daresbury Laboratory in the UK, which was commissioned in 2010. The key behind the CBETA design is to recirculate the beam four times through the SRF cavities, allowing electrons to be accelerated to four very different energies. The beam with the highest energy (150 MeV) will be used for experiments, before being decelerated in the same cavities four times. During deceleration, energy is taken out of the electron beam and is transferred to electromagnetic fields in the cavities, where the recovered energy is then used to accelerate new particles. Reusing the same cavities multiple times significantly reduces the construction and operational costs, and also the overall size of the accelerator. The energy-saving potential of the CBETA technology cannot be understated, and is a large consideration for the project’s funding agency the New York State Energy Research and Development Authority. By incrementally increasing the energy of the beam through multiple passes in the accelerator section, CBETA can achieve a high-energy beam without a high initial energy at injection – characteristics more commonly found in storage rings. CBETA’s use of permanent magnets provides further energy savings. The precise energy savings from CBETA are difficult to estimate at this stage, but the machine is expected to require about a factor of 20 less RF power than a traditional linac. This saving factor would be even larger for future ERLs with higher beam energy. 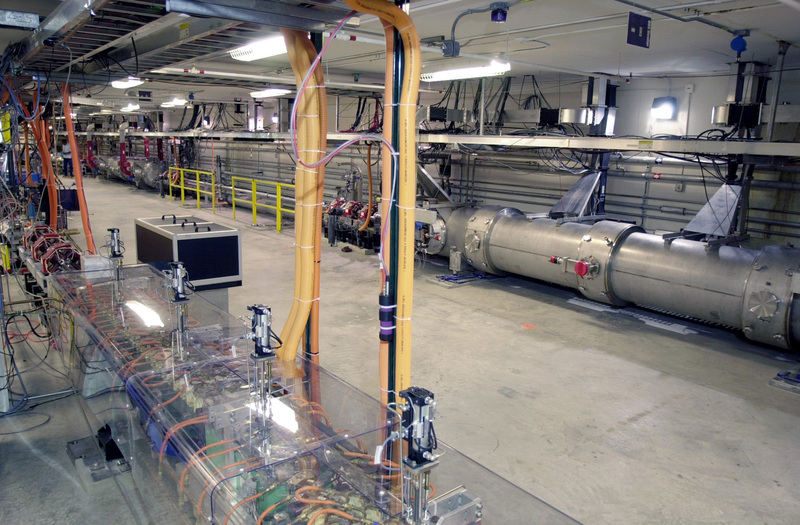 SRF linacs have been operated in ERL mode before, for example at Jefferson Lab’s infrared free-electron laser, where a single-pass energy recovery has reclaimed nearly all of the electron’s energy. CBETA will be the first SRF ERL with more than one turn and is unique in its use of a single return loop for all beams. Simultaneously transporting beam at four very different energies (from 42 to 150 MeV) requires a different bending field strength for each energy. While traditional beamlines are simply unable to keep beams with very different energies on the same “track”, the CBETA design relies on fixed-field alternating-gradient optics. To save energy, permanent Halbach magnets containing all four beam energies in a single 70 mm-wide beam pipe were designed and prototyped at Brookhaven National Laboratory (BNL). The special optics for a large energy range had already been proposed in the 1960s, but a modern rediscovery began in 1999 at the POP accelerator at KEK in Japan. This concept has various applications, including medicine, nuclear energy, and in nuclear and particle physics, culminating so far with the construction of CBETA. Important aspects of these optics will be investigated at CBETA, including the following: time-of-flight control, maintenance of performance in the presence of errors, adiabatic transition between curved and straight regions, the creation of insertions that maintain the large energy acceptance, the operation and control of multiple beams in one beam pipe, and harmonic correction of the fields in the permanent magnets. Harmonic field correction is achieved by an elegant invention first used in CBETA: in order to overcome the magnetisation errors present in the NdFeB blocks and to produce magnets with 10–3 field accuracy, 32 to 64 iron wires of various lengths are inserted around the magnet bore, with lengths chosen to minimise the lowest 18 multipole harmonics. A multi-turn test ERL was proposed by Cornell researchers following studies that started in 2005. Cornell was the natural site, given that many of the components needed for such an accelerator had been prototyped by the group there. A collaboration with BNL was formed in the summer of 2014; the test ERL was called CBETA and construction started in November 2016. CBETA has some quite elaborate accelerator elements. The most complex components already existed before the CBETA collaboration, constructed by Cornell’s ERL group at Wilson Lab: the DC electron source, the SRF injector cryomodule, the main ERL cryomodule, the high-power beam stop, and a diagnostic section to map out six-dimensional phase-space densities. They were designed, constructed and commissioned over a 10-year period and hold several world records in the accelerator community. These components have produced the world’s largest electron current from a photo-emitting source, the largest continuous current in an SRF linac and the largest normalized brightness of an electron bunch. Meanwhile, the DC photoemission electron gun has set a world record for the average current from a photoinjector, demonstrating operation at 350 kV with a continuous current of 75 mA with 1.3 GHz pulse structure. It operates with a KCsSb cathode, which has a typical quantum efficiency of 8% at a wavelength of 527 m and requires a large ceramic insulator and a separate high voltage, high current, power supply to be able to support the high voltage and current. The present version of the Cornell gun has a segmented insulator design with metal guard rings to protect the ceramic insulator from punch-through by field emission, which was the primary limiting factor in previous designs. This gun has been processed up to 425 kV under vacuum, typically operating at 400 kV. The SRF injector linac, or injector cryomodule (ICM), set new records in current and normalized brightness. It operates with a bunch train containing a series of five two-cell 1.3 GHz SRF cavities, each with twin 50 kW input couplers that receive microwaves from high-power klystrons, and the input power couplers are adjustable to allow impedance matching for a variety of different beam currents. The ICM is capable of a total energy gain of around 15 MeV, although CBETA injects beam at a more modest energy of 6 MeV. The high-current CW main linac cryomodule, meanwhile, has a maximum energy gain of 70 MeV and a beam current of up to 40 mA, and for CBETA will accelerate the beam by 36 MeV on each of the four beam passes. 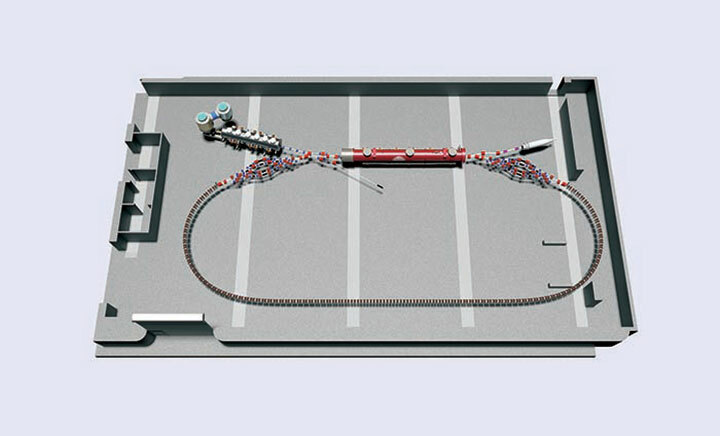 Several other essential components that have also been commissioned include a high-power beam stop and diagnostics tools for high-current and high-brightness beams, such as a beamline for measuring 6D phase-space densities, a fast wire scanner for beam profiles and beam-loss diagnostics. All these components are now being incorporated in CBETA. While the National Science Foundation provided the bulk funding for the development of all these components, the LCLS-II project contributed funding to investigate the utility of Cornell’s ERL technology, and the company ASML contributed funds to test the use of ERL components for an industrial EUV light source. Complementary development work has been ongoing at BNL, and last summer the BNL team successfully tested a fixed-field alternating-gradient beam transport line at the Accelerator Test Facility. It uses lightweight, 3D-printed frames to hold blocks of permanent magnets and uses the above-mentioned innovative method for fine-tuning the magnetic field to steer multiple beams at different energies through a single beam pipe. With this design, physicists can accelerate particles through multiple stages to higher and higher energies within a single ring of magnets, instead of requiring more than one ring to achieve these energies. The beams reached a top momentum that was more than 3.8 times that of the lowest transferred momentum, which is to be compared to the previous result in EMMA, where the highest momentum was less than twice that of the lowest one. The properties of the permanent Halbach magnets match or even surpass those of electromagnets, which require much more precise engineering and machining to create each individual piece of metal. The success of this proof-of-principle experiment reinforces the CBETA design choices. 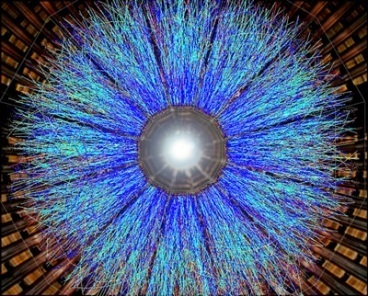 The initial mission for CBETA is to prototype components for BNL’s proposed version of an EIC called eRHIC, which would be built using the existing Relativistic Heavy Ion Collider infrastructure at BNL. JLAB also has a design for an EIC, which requires an ERL for its electron cooler and therefore also benefits from research at CBETA. Currently, the National Academy of Sciences is studying the scientific potential of an EIC. More than 25 scientists, engineers and technicians are collaborating on CBETA and they are currently running preliminary beam tests, with the expectation of completing CBETA installation by the summer of 2019. Then we will test and complete CBETA commissioning by the spring of 2020, and begin to explore the scientific applications of this new acceleration and energy-saving technique. 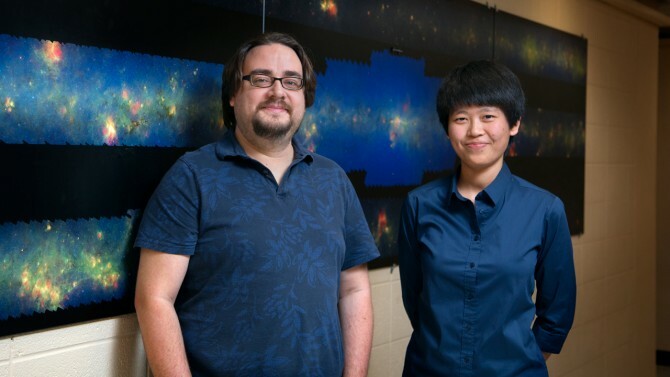 Dominik Riechers, left, and doctoral candidate Daisy Leung discovered two hyper-luminous galaxies, which help to reveal cosmic creation. A pair of massive, hyper-luminous galaxies are merging in front of astronomer’s eyes for the first time and revealing secrets of cosmic creation. Found in the Southern Hemisphere’s Dorado constellation – known as the swordfish – the ADFS-27 galactic pair is located about 12.7 billion light years away. Astronomers are seeing these galaxies in their infancy – at a few hundred million years old – and the light from the galaxies have taken nearly 13 billion years to reach our eyes. In the paper, “Rise of the Titans: A Dusty, Hyper-luminous ‘870 µM Riser’ Galaxy at Z~6, Riechers, doctoral candidate T.K. 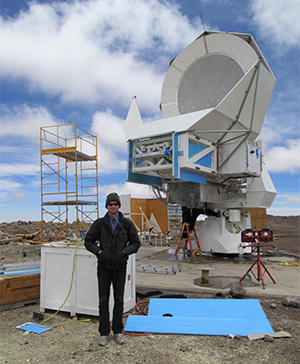 Daisy Leung and their colleagues captured coalescing galaxies – likely the most massive systems in the universe – by using the Atacama Large Millimeter/submillimeter Array (ALMA), a high-elevation radio telescope in Chile, to detect their merger into a single galaxy. The merger of the two galaxies has triggered violent, ongoing star formation and lead to the growth of a very massive galaxy in later cosmic epochs, Riechers said. In addition to Riechers and Leung, 13 scientists from 11 institutions served as co-authors on the paper. The Atacama Large Millimeter/submillimeter Array – close to Cornell’s forthcoming Cerro Chajnantor Atacama Telescope-prime, slated for completion in 2021 – is an international astronomy facility, in partnership between the European Southern Observatory, the National Science Foundation and the National Institutes of Natural Sciences of Japan, in cooperation with the Republic of Chile. Imagine walking through the Northwest wilderness, camera phone at the ready, hoping to catch at least a faint glimpse of Bigfoot, and instead returning home with an Ansel Adams-quality picture of the mythical beast as he lumbers past you. That’s kind of what a team led by physics professor Paul McEuen has done in research into the optical properties of single-atom-thick layers of graphene. Combining the technical strengths of two Kavli Institute at Cornell for Nanoscale Science (KIC) postdoctoral fellows, as well as measuring tools from the lab of electrical and computer engineering professor Farhan Rana, the group reports remarkably clear observations of excitons – electrically neutral quasiparticles – in bilayer graphene. And the excitons’ unique properties and behavior make this material of possible interest in the development of optoelectronic devices, including lasers. Infrared light illuminates bilayer graphene and create an exciton – a pairing of electron and hole, locating mostly at the top and bottom layers, respectively, of carbon atoms. Provided. 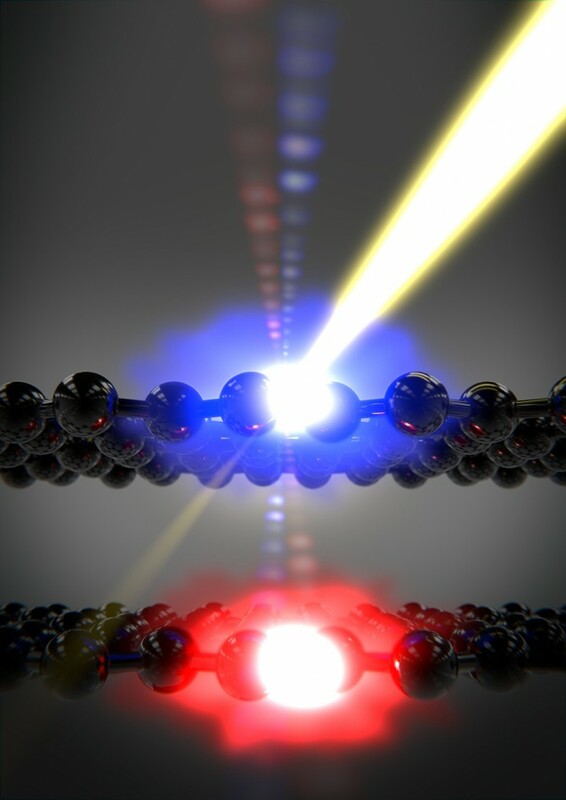 “We kind of knew we’d have a chance to see these excitons, but the outcome turned out to be even more interesting than we thought it would be,” said Long Ju, co-lead author of “Tunable Excitons in Bilayer Graphene,” to be published Nov. 17 in Science. Ju and fellow lead author Lei Wang are both Kavli postdocs and members of Cornell’s Laboratory of Atomic and Solid State Physics. An exciton is the bound state of an electron and a hole (the space left by an electron following excitation), and is “the most fundamental optical property of any semiconductor,” Ju said. Most materials have properties that make them either a metal or a semiconductor, but graphene can act as either by tuning its bandgap – basically, the measure of its ability to conduct electricity – by hitting it with an electric field. Graphene is intrinsically a metal, but by adjusting its bandgap, you can tune it from a metal to a semiconductor. For this experiment, Wang constructed bilayer graphene encapsulated in a hexagonal lattice of boron nitride. “The high quality of samples is one key element to observe the intrinsic properties in this experiment.” Wang said. This means that when the bilayer graphene was hit with an electric field, the resulting exciton was clear to see. When the sample was hit with electricity, an electron preferably occupied one of the two layers, and exhibited much greater “pseudospin” magnetism than electrons in typical semiconductors. The exciton inherits this very large electron “magnetic moment” (basically, sensitivity to magnetism) in the material. The excitonic resonances the group observed are tunable from the mid-infrared to the terahertz range, making bilayer graphene of potential interest in the development of new kinds of lasers and detectors. “Vibrations of molecules – which provide chemical information about what a material is – often occur at a frequency that corresponds in energy to this bandgap that you can tune through,” McEuen said. A key piece of this research was the availability on campus of the instruments used to clearly see what was happening at the nanoscale level. The group employed photocurrent spectroscopy, along with a magneto-optical cryostat, from the Rana lab. McEuen, the John A. Newman Professor of Physical Science, said this work is the product of a collaboration between several groups at Cornell, UC Berkeley, Columbia and the National Institute of Materials Science in Japan. Leading it are two of the top young scientists in their respective disciplines. Both developed their technical expertise as doctoral students – Ju at the University of California, Berkeley, and Wang at Columbia University. In addition to the Kavli Institute, this work was supported by the Cornell Center for Materials Research, which is funded by the National Science Foundation, and by grants from the Air Force Office of Scientific Research and the Office of Naval Research.